The Mountain East Conference continued to leave its mark on the Division II football landscape as the Notre Dame Falcons nearly reached the championship game. This was the fifth time since the 2010 season that a team from the MEC reached the national semi-finals. The Falcons finished the regular season undefeated, earned the #1 seed in Super Region 1, and eliminated Hillsdale College and Slippery Rock University enroute to the national semi-finals. 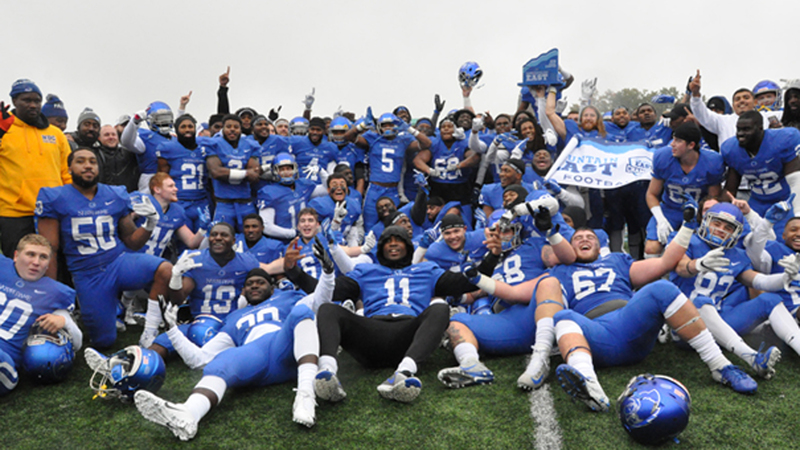 In the semi-final contest against Valdosta State, Notre Dame College held the Blazers to their lowest points of the season; and narrowly lost by six points to a team who defeated their other two playoff opponents by 50 and 60 points. The overwhelming theme on the DII message boards was that Notre Dame College was still underrated and definitely made believers out of people during their run; particularly during the game against Valdosta State. Entering the season, I asked if the Falcons could defeat the other top teams in the conference and finally earn a spot in the post-season. They responded with a definitive, Yes! Notre Dame College will enter the 2019 season as the top of the conference. Their offense was led by the legs of true freshman running back Jaleel McLaughlin who rushed for over 2,400 yards and 18 rushing touchdowns. The air assault saw many connections from redshirt-freshman quarterback Chris Brimm who completed three touchdown passes (24) for every 1 interception (9), and junior wide receiver Marvelle Ross who had 1,200+ receiving yards and 10 touchdown receptions. The defense proved to be very opportunistic, highlighted by junior lineman Sha’haun Williams who had 20 sacks, sophomore linebacker Guam Lee who had 57 solo tackles, junior linebacker Curtis Collins who like Lee had over 90 total tackles, and sophomore defensive back Jeffrey Thomas who had 27 pass break ups. Needless to say, but I’ll say it anyway, the Falcons have a lot of weapons returning for 2019 to help them stay at the top of the class in the Mountain East Conference. 1. Will Shepherd close out its tenure in the Mountain East Conference with one more championship? The Rams won the inaugural MEC championship; and four-out-of-five altogether. No. Shepherd didn't get off to a good start as they lost to NDC in the opening week, lost to Fairmont State further into the season, and bookended the season with a season-ending loss at home to UVA-Wise to close out a disappointing season. This marked the first time since the 2009 season when the Rams lost 3-or-more games in the regular season. 2. Can Notre Dame College finally make its first post-season birth as a member of the MEC? They are a top-tier team who is coming off of two seasons (8-3, 9-2) where the playoffs were within reach. Yes they can; and Yes they did! The Falcons simply found ways to win each game as they went undefeated in the regular season, earned the number 1 seed in SR1, and reached the semi-finals where they finally lost on the road at Valdosta State. 3. Will WV State begin to pick off the conference's top tier teams as they become one themselves? Sporting one of the conference's best offenses, the Yellow Jackets closed out their final 2017 seven-game stretch with a 5-2 record. No. But for the second consecutive season the Yellow Jackets finished with a winning record at 6-5. And for the second year in a row they finished their final seven-game stretch with a 5-2 record. 4. Will the Golden Eagles' offense step up to compliment their defense which has quietly become one of the toughest in the conference? Four of the University of Charleston's six losses were by 5 points or less. In some aspects yes, in other aspects no. The Golden Eagles’ scoring offense went up 5 points per game and they moved up a spot into 7th. Passing offense went up significantly averaging nearly 50 more passing yards per game, moving up from 8th to 5th place in that category. The rushing offense however, suffered a 50 yards per game decrease as UC dropped from 2nd in the MEC in rushing offense to 4th. Time of Possession and 3rd-down conversion percentages both got better, but their rank in the conference dropped as others teams were experiencing greater improvement. At the end of the day though, the category that matters is Wins and Losses, and the Golden Eagles won two more games in 2018 as they finished with a winning record at 6-5. 5. How will Shepherd's defense rebound in 2018? The Rams' offense continued to dominate in 2017, maintaining its rank but still ascending the charts by statistical measurements; while the defense statistically dropped in many key categories. Statistically-speaking, the numbers don’t reflect the record. Scoring, Total and Passing defense improved. Dominating the line of scrimmage proved to be a weak spot as the Rams allowed over 100 rushing yards per game and had 9 fewer sacks on the season. While the scoring offense stat improved, the Rams only held opponents to under 20 points just twice this past season, compared to 4 times in 2017—both significant drop offs from the national semi-final years where they held teams to fewer than 20 points 7 times in 2016 and 8 times in 2015—including twice in the playoffs. 6. Can Urbana find consistency in 2018? The Blue Knights' seemed to be either hot or cold in 2017. Their record break down goes like this: 0-2, 3-0, 0-4, 2-0. The Blue Knights split the first two games, then went on a three game winning streak, followed by a four game losing streak and a final win to close out the season. UU was undefeated during night games (4-0), 5-1 in night games over the past two seasons. 8. How strong will Wheeling Jesuit look during their first season of competitive football as they prepare for their first season of MEC play? TBD. Undefeated in exhibition play; all but one game by large margins. If they want to compete at the DII level they did what they should have done. But due to the nature of their competition, that doesn’t really tell us much going forward. The school is also currently experiencing financial issues so time will tell what kind of impact, if any, that has on the Cardinals' football program. 9. What will the conference landscape look like prior the start of next season? Shepherd and UVA-Wise are out. Wheeling Jesuit and Frostburg State are in. Does anyone else leave, does anyone else join? New head coaches at WV Wesleyan and Glenville State--who lured Mike Kellar away from West Liberty where many thought he was biding his time to be the next head coach on the Hilltop. Wheeling Jesuit is having financial issues “exigency,” but TBD on how will that impact football. UNC-Pembroke is set to begin MEC play next season as an associate member beginning in 2020. 10. Who will win the D2Football.com Message Board's MEC Pick 'Em for 2018? Games begin Thursday evening, so hurry up and submit your picks here. A big CONGRATULATIONS goes out to Clydes ‘N Rams who compiled a 51-13 record and a 2-game margin of victory. D2Football.com is seeking coverage for the Mountain East Conference beginning with the 2019 season. In addition to numerous additional duties I've incurred at work as well as with other organizations/activities I'm a part of, I know a good bit of my focus will be away from the MEC as I follow Shepherd's pursuits in the PSAC. While I tried to cover each team without any bias, I am an alum of Shepherd and naturally a Ram fan. I am grateful for the opportunity to cover the Mountain East Conference as I gained a more intimate knowledge of each program within the conference than I would have staying in my Shepherd bubble and focusing on their one opponent for the week. I was excited for Notre Dame College to break into the post-season and turn heads like they did in the semi-final game against Valdosta State. I will always keep my eye on the MEC from wherever my pursuits take me. It's a labor of love that can send you down statistical rabbit holes at 2 am as you're trying to come up with something to write about for any given matchup. I like to think on occasion I sounded like I knew what I was talking about although if it worked out chances were I just lucked into it. But definitely a worthwhile endeavor. If you are interested in covering the MEC for the site, feel free to get in touch with Brandon or myself to express your interest; and feel free to ask any questions you may have--I'll help as best as I can.